I thought clean plates and silverware in the dishwasher were safe. Freshly washed and sparkling, they hold no interest for a curious dog. I wanted to believe this. I had no reason not to. I’m a procrastinator, I am lazy, and I am easily distracted. Sometimes it takes me an hour to unload the dishwasher. But, it’s not a big deal because the animals will leave the clean things alone. Sure, I’ve caught a dog with her mouth around a fork, trying to lick the last bit of flavor from it. Or watched as a big head tries to find enough room to clean up microscopic remainders of cat food from neatly loaded cat plates. 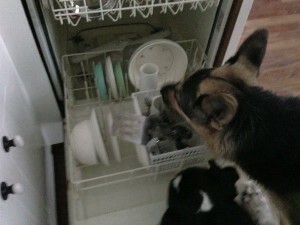 The dishwasher, while several years old, does a fine job of cleaning, not even leaving soap residue behind. Nothing left behind for a dog to enjoy. My dream world imploded around me this morning. It’s so disappointing when illusions are licked out of existence.